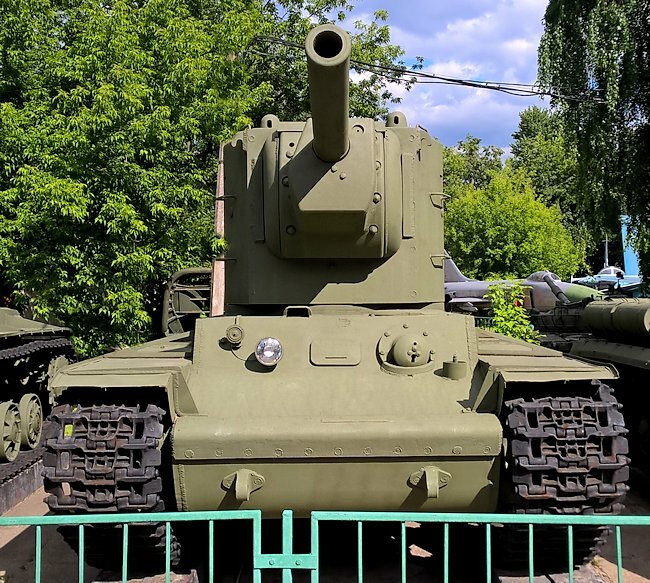 This Russian Soviet WW2 KV-2 Heavy Tank can be found at the Central Armed Forces Museum, Moscow, Russia. It was manufactured in in June 1941, it has the Serial Number 4744. 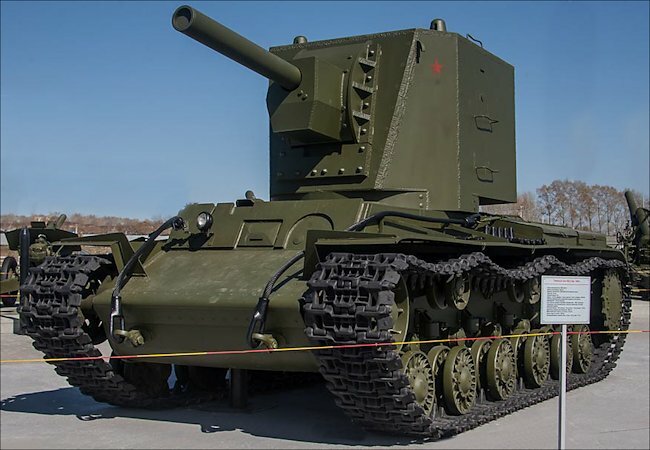 It was one of the later KV-2 tanks to be produced and is the only surviving example of a complete original tank. In 1941 the KV-1 tank was the most heavily armoured and powerful combat vehicle in the world. It had its faults but it horrified the Germans who found it difficult to knock out. One of the drawbacks of the tank was that it was very heavy and was not as fast as the T34 medium tanks. Had a problem keeping up with them. It did have a few advanced design features like the torsion bar suspension system and the compressed air starter. Unfortunately the steering often gave trouble because the length of the tank. Despite its low speed the KV2 used its V2 12-cylinder diesel engine to great effect. It was an excellent engine that produced 550 horsepower. It was simple and easy to maintain. It had the great benefit of being a diesel engine which meant it was much easier to start in the cold Russian winters than a similar petrol engine. There were less problems with ignition and damp. KV-2 tank crew would get onto the tank from the front of the front sloping armoured plates. The commander and gun crew would then use the handles on the side of the target to climb onto the top of it and then open the crew hatches. During the 1939 winter war with Finland it became obvious to the Soviet High Command that a KV1 tank with a bigger gun capable of knocking out enemy fortifications was required. The problem of mounting a larger gun was that a bigger target was required to house it. 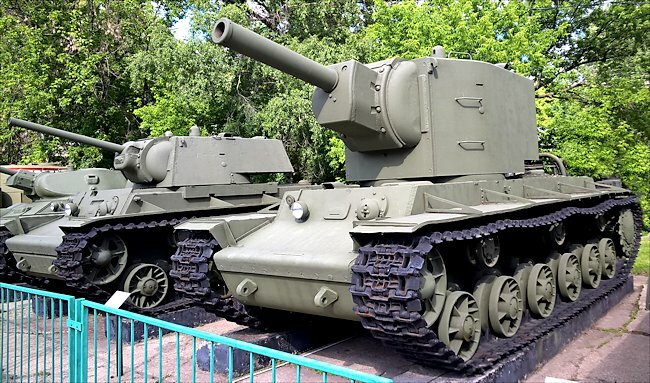 The Soviet tank designers decided to adapt the KV 1 tank chassis. The resulting tank was called the KV2. The Russian tank crews nicknamed it the 'dreadnought'. Initially the designers tried to mount a 122mm cannon but a decision was made to upgrade it to a 152mm M1938 L/24.3 (6 inch) caliber howitzer. The weight and centre of gravity of the tank were dramatically altered. The addition of a larger gun totally change the shape of the KV tank. It required a six-man crew: Commander, Gunner, Radio operator, driver and two loaders. It was also designed to have two 7.62mm machine guns: one fitted in the hull and another at the rear of the turret. A big disadvantage of having to install a larger gun was that the tank had a very tall profile and was easily spotted by the enemy. The KV-2's real baptism of fire came in 1941. Despite signing a non-aggression pact with the Soviet Union Hitler decided to invade Russia because he did not trust Stalin. This German pre-emptive strike was called operation Barbarossa. To defeat the red Army Hitler sent a force of over 3 million men. It was backed up by hundreds of thousands of armoured vehicles, artillery, horses and aircraft. Their aim was to capture Leningrad, Moscow and Kiev. The main German battle tanks were the Panzer Mark III and IV. Hitler did not expect a struggle. There was consternation in some cases panic when German troops met in battle the Russian T 34/76, KV-1 and KV2 tanks. They found that the 37 mm and 50 mm guns currently fitted to their tanks could not penetrate the front armour on these vehicles. Their shells just bounced off. The only gun that could knock out a KV1 or KV2 tank was the German 88 mm anti-tank gun. Stalin's purges of junior and senior officers in the army meant that some tank crews only received a few hours training. Many unit commanders had no idea how to deploy tanks on the battlefield. This situation was not remedied until late 1942. By mid-1942 the KV-2 tank, although an awesome site on the battlefield, was limited in many different ways. For example the ball bearings that were used on the turret were not strong enough to handle the weight of the gun and the turret. The turret could only traverse 360° when the tank was stationary and on flat terrain. On uneven ground the driver would have to move the whole tank to bring the gun to bear in a target very much like a tank destroyer. Although it was a very impressive weapon it did have serious limitations. It had a very powerful gun but the tank crews found it could not be used effectively on an undulating battlefield. It was a good tool for bunker busting but the tank crews realise they were sitting targets. It was so big that it could not be camouflaged. Once spotted it would be subject to artillery attack and aerial bombing by the Luftwaffe. There was a school of thought in the Russian army that everything big must be good. It was not true in this case. The German army made an anti-tank training film showing troops going to the eastern front, how to knock out a KV2 tank. It highlighted the anti-infantry pistol slots found in the side of the tank's turret between the two handgrips and in the centre of the rear door. 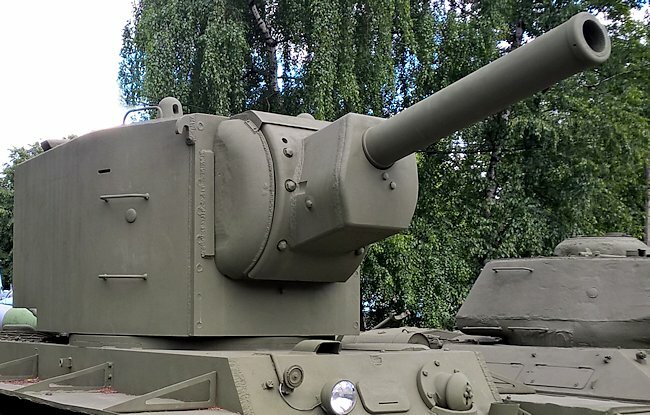 They enabled the KV2 tank crew fire on advancing infantry with machine guns or pistols. A metal plug on the chain was used to close the whole from inside the target. The infantry soldier was advised to work as a team and try to blind the tank crew as to what was going on outside. They would ambush a tank after laying hidden and letting it drive past them. They were instructed to jump up on the tank chassis just behind the turret. Tar, canvas sheeting, uniform hats and equipment bags were used to cover vision slits and periscope lenses. Most tanks carried tools on the outside of the chassis. Troops could uncouple these tools and use them to damage external machine gun ports. Many Panzergrenadier units carried axis and crowbars in their half tracks. These are ideal for jamming the turret so it could not swing around and use its coaxial machine gun or main canon in self defence. These implements were then used for prising open crew hatches to enable hand grenades to be dropped down them. One effective tactic the Germans learnt from the Russian infantry was the use of Molotov cocktails. When a Russian attack was expected the troops made sure they had a good supply of these home-made incendiary bombs. They would stay hidden in their foxholes until they were able to throw their Molotov cocktails at the side and back of the passing tank. The object was to get the inflammable liquid on to the back of the engine hatch where it could seep into the engine compartment and cause an explosion. In urban areas infantry were taught to throw open Jerry cans of petrol onto the backs of tanks from the upper floors of buildings and set light to them. 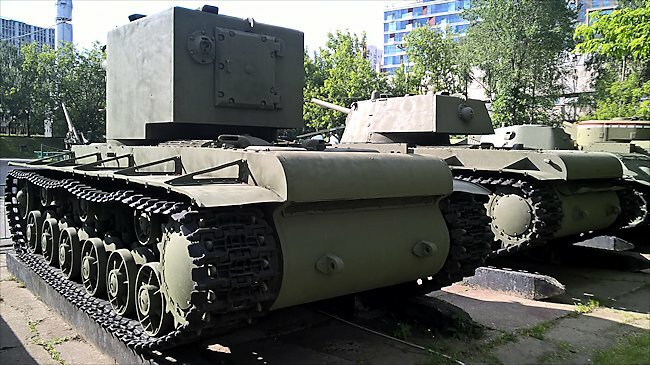 Where can I find other preserved KV-2 Tanks?